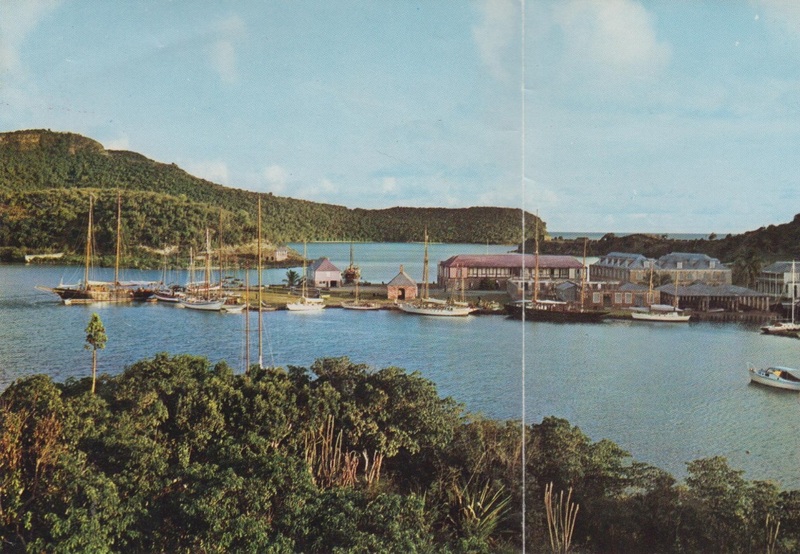 Nicholson Yacht Charters, Inc. was established in English Harbour, Antigua in 1949, and in those days the style of yachts was largely wooden, classic, monohull yachts with lots of old world charm and leaded glass cupboards. Since those days the style of yacht has gone from classic Fife-type schooners to modern auxiliary sailing ketches to super large, state of the art power yachts. The Virgin Islands today see mostly deluxe catamarans with their comfortable indoor/outdoor “living rooms” and amenities…. During the 1950s and 60s when my grandfather, Commander Vernon E. B. Nicholson, plied the Windward and Leewards aboard his 70’ schooner, Mollihawk, many wonderful Adventurers visited the Eastern Caribbean. My grandfather often entertained them in his house in English Harbour, Antigua. Those Adventurers remember their travels through the Caribbean during those days and still write to us to find out how we are. I sailed into English Habour onboard a ketch called Bonaventura, she was a sailing Brixham trawler styled yacht. The owner was a Scot by the name Barr-Pollock. This was in 1957-58. Is the vessel still around?.I just read your history and felt a little part of it! 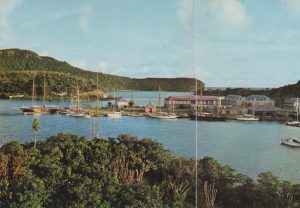 We love to be remembered by yachtsmen who cruised in Antigua during the Fifties and Sixties… Those years were good for Antigua. Wouldn’t Paul be delighted to hear that Nelson’s Dockyard today still stands out as the best restored Georgian dockyard in the world and is still maintained by the National Park to perfection, full of tropical plants, the buildings all in excellent repair, each serving different purposes, still catering to the ever-vibrant International sailing crowd. Antigua is still a popular sailing destination, particularly among sailors who enjoy racing, and by people who enjoy cruising and sailing, and the Caribbean islands. I remember a yacht called BONAVENTURE but I don’t recall whether she was a Brixham trawler…. My mother Julie P. Nicholson remembers the Brixham Trawler BONAVENTURE well, but she doesn’t know details of her survival. She believes the boat must have sold or sunk or was not salvaged… I remember another 65’ Brixham Trawler MAVERICK that sailed the Virgin islands through the sixties and seventies…. She too has departed the charter trade, and we don’t know what became of her. We hope both of them were restored. Classic yachts are still so vital. They still turn heads at the dock. They still feel so good to be on, although people do get pulled in by the comforts of the modern auxiliary sailing yachts of today. For those of us who know there’s not really that much difference between the comforts of a classic yacht and a modern yacht, we would continue to choose a classic yacht to sail on any day. 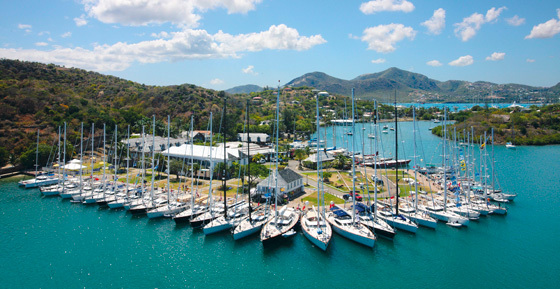 With offices now in Maine and Massachusetts, Nicholson Yacht Charters, Inc. still represents sailing yachts in Antigua and the Eastern Caribbean. We still love hearing from old friends, and Antigua is still the friendliest island in the whole of the West Indies. We’re also pleased to report that the island of Antigua suffered no damage from Hurricane Irma whatsoever. While Antigua’s sister island Barbuda was not so lucky, the islands from Antigua south to the Grenadines are still in tact. They might perhaps be the destination of choice for your winter sailing holiday this year.